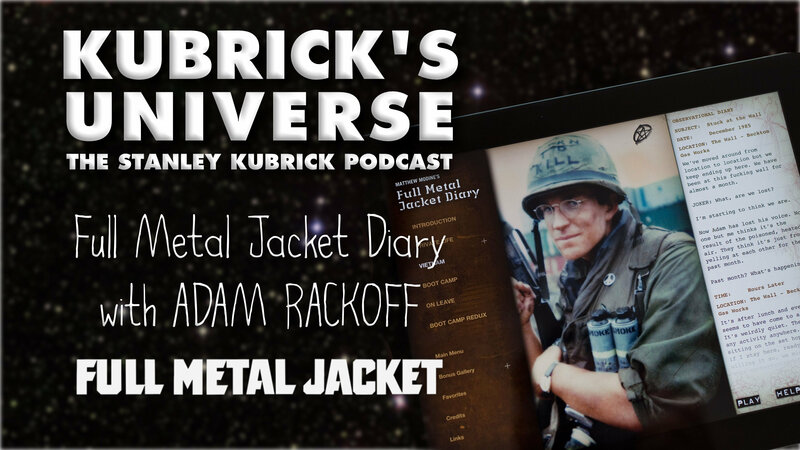 07 Adam Rackoff : In this episode of Kubrick's Universe, producer Adam Rackoff talks about his Full Metal Jacket Diary App and Full Metal Jacket Diary Audiobook, and about his work with Matthew Modine. Adam Rackoff is a New York-based filmaker with numerous credits, including 27 as producer, on feature films, shorts, documentaries, and even a video game. But he is best known among Kubrick fans for his collaborations with Matthew Modine on the Full Metal Jacket Diary iPad App, and later the Full Metal Jacket Diary Audiobook. Adam met Matthew when he came into the Apple Store that Adam was working at, as part of the "Made on a Mac" series. This eventually led to the Full Metal Jacket Diary App. Wikipedia defines a "killer app" as "any computer program that is so necessary or desirable that it proves the core value of some larger technology, such as computer hardware, a gaming console, a software platform, or an operating system. An example would be Lotus 123 for the PC in the 1980's. Kubrick fans would argue that Adam and Matthew's Full Metal Jacket Diary app is just such a one for the iPad -- as a brand new, incredibly immersive way to experience a book. The app includes numerous "special features", including web links relating to the project. In one of them, from 2010, Matthew writes: "Last spring I was gifted an iPad. It's an interesting device. I downloaded a couple of iBooks and different apps. It's pretty cool. I also owned a Kindle, but wasn't enthusiastic about the prospect of reading on it. My friend and I were talking about the experience of reading on electronic devices and imagined that if a developer could make the experience more cinematic and interactive, then digital books could take the reader on a unique journey. I realized then, that my friend and I could do just that and the iPad could be the perfect platform to re-release my book. My friend became my design partner and producer on the Full Metal Jacket Diary app." Adam is obviously you are the "friend" here -- Welcome to Kubrick's Universe.